We aim to help you with your compression stockings sizing. Obtain the right measurements to help ensure the correct fit. Remember, first of all to measure yourself in the morning. What Compression Stockings Sizing is right for me? We must emphasise that all measurements for compression stockings sizing need to be completed first thing in the morning before active movement is undertaken, before your legs have had a chance to swell. You will have a more accurate fit in the morning and as a result it will make ordering online a breeze. You can be seated whilst taking measurements for your knee high stockings. 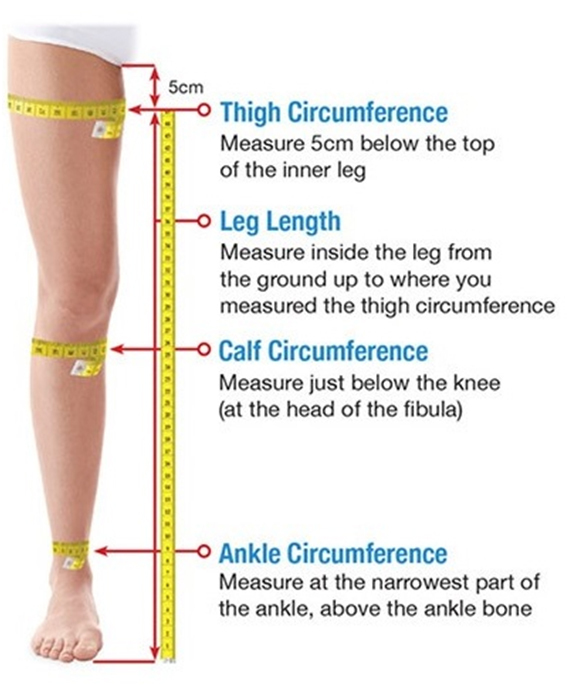 *Measure each leg individually & the lengths should be measured (ID, IF, IG) as required. What size is arm sleeve is right for me? *Complete all measurements first thing in the morning before active movement is undertaken. Determine your correct size by following the JINNI MD Sizing Chart. When putting on stockings, remove all jewellery to avoid snagging the material with fingernails. Ensure your compression stockings/garment are the right fit to increase the effectiveness and comfort of the compression garment.